Heat shock Protein 90 (Hsp90) is a molecular chaperone that folds,stabilizes, and functionally regulates many cellular proteins involved inoncogenic signaling and in the regulation of radiosensitivity. It isupregulated in response to stress such a heat. Hyperthermia is a potentradiosensitizer, but induction of Hsp90 may potentially limit its efficacy.Our aim was to investigate whether the new Hsp90 inhibitor NVP-HSP990increases radiosensitivity, thermosensitivity and radiothermosensitivity ofhuman tumor cell lines. U251 glioblastoma and MIA PaCa-2 pancreatic carcinoma cells were used. Todetermine clonogenic survival, colony forming assays were performed. Cellviability and proliferation were assesed by Trypan blue staining. Cell cycleand apoptosis analyses were performed by flow cytometry. DAPI staining wasused to detect mitotic catastrophe. NVP- HSP990 increased the thermosensitivity, radiosensitivity andradio-thermosensitivity of both cell lines in clonogenic assays.72 hours after irradiation with 4 Gy, a significant reduction incell number associated with considerable G2/M acumulation and mitoticcatastrophe as well as cell death by apoptosis/necrosis was observed. Treatment with NVP- HSP990 strongly sensitized U251 and MIA PaCa-2cells to hyperthermia and ionizing radiation or combination thereof throughaugmentation of G2/M arrest, mitotic catastrophe and associatedapoptosis. Heat shock protein 90 (Hsp90) is an evolutionary conserved molecular chaperone whichunder physiological conditions participates in protein folding, intracellulartransport, maintenance and degradation of proteins. Proteins, which are activatedand stabilized by Hsp90, are referred to as “clients”. A lot of them arecrucial for constitutive cell signaling and adaptive responses to stress . Hsp90 is expressed at 2–10-fold higher levels in tumor tissue thanin normal tissue . Its most important function is to protect mutated and overexpressedoncoproteins from misfolding and degradation. It has been recognized to be essentialfor the stability and function of a wide variety of kinases such as EGFR, Erb-B2,Akt, BCR-ABL, VEGFR2 involved in cell cycle regulation, survival and oncogenicsignaling . These proteins play also critical roles in the regulation ofradiosensitivity [4–6]. Thus, the inhibition of Hsp90 may represent an attractive therapeuticstrategy not only reducing basal survival of tumor cells but also increasing theirradiosensitivity. Heat is a very potent radiosensitizer in vitro and in vivo[7, 8]. Clinical studies have shown that the combination of conventionalradiation therapy with hyperthermia leads to significantly better tumor control . Hsp90 is heat-inducible in normal and in tumor cells . This heat induction of Hsp90 could limit desirable effects of ionizingradiation (IR) via activation of “client proteins” which may contributeto radioresistance as mentioned above. Theoretically, small molecules designed toinhibit Hsp90 might increase the effect of hyperthermia followed by enhancedradiosensitivity. NVP-HSP990 is a novel, highly potent orally available 2-aminothienopyrimidine class,non-geldanamycin based Hsp90 inhibitor . It has been shown that treatment of established cell lines fromdifferent tumor entities with the non- geldanamycin based Hsp90 inhibitorsNVP-BEP800 and NVP-AUY922 increase their sensitivity towards IR . Glioblastoma multiforme and pancreatic carcinoma represent tumors which are resistantto conventional radiochemotherapeutical regimes and despite intensive research anddevelopment of new targeted therapies prognosis of patients with these tumorsremains poor [13, 14], indicating the need for new therapeutic approaches. Here we investigated whether treatment with the Hsp90 inhibitor NVP-HSP990 andhyperthermia enhance thermal sensitivity and consequently radiosensitivity of U251glioma and MIA PaCa-2 pancreatic carcinoma cells. The U251 human glioblastoma and pancreatic carcinoma MIA PaCa-2 cell line wereobtained from the tumor bank of the National Cancer Institute (NCI), Frederick,Maryland. Cells were grown as a monolayer in RPMI-1640 culture mediumsupplemented with 10% foetal bovine serum (FBS; Biochrom, Berlin, Germany) at37°C under 8.5% CO2. NVP-HSP990 was kindly provided by NovartisInstitutes for Biomedical Research (Basel, Switzerland). The drug was dissolvedin DMSO and stock solutions were stored at −20°C. Hyperthermia was provided by a cell incubator (Heraeus, type Heracell), reachingtemperatures of up to ~55°C with a precision of 0.1°C. The temperatureof 37°C was chosen as control. Before starting a hyperthermia, thetemperature was controlled with 3 thermocouples from the interstitialhyperthermia device (Academic Ziekenhuis Utrecht, The Netherlands), which wereinserted in needles and placed in the cell culture flasks filled with 5 mlculture media. Each thermocouple has 7 different points from which thetemperature was measured. When the average temperature value in the incubatorreached 42°C, the cells were incubated for 1 hour and afterwardsreplaced to 37°C. To investigate the effect of NVP-HSP990 on colony formation as a sole compound,cells were treated with increasing drug concentrations (0.01, 0.02, 0.05 and0.1 μM). In combination treatment with hyperthermia, the cells weretreated with the same drug concentrations. Immediately after adding the drug,the cells were incubated for 1 hour at 42°C and afterwards replacedto 37°C. 24 hours later, the cells were trypsinised and 100 cellswere plated for colony forming assay (CFA) without drug using25 cm2 tissue flasks (Falcon Becton-Dickinson,Germany). Irradiation was performed at room temperature using a Gammacell 40137Cs laboratory irradiator. After irradiation, the cells wererecovered in growth medium for 24 hours until harvest. 200.000 U251 cells were seeded in 25 cm2 tissue culture flasksand 24 hours later treated with 0.02 or 0.1 μM NVP-HSP990.Control cells were treated in parallel with respective concentrations of DMSO asa vehicle control. 24 hours after start of treatment with NVP-HSP990, thecells were trypsinised and plated for CFA without drug. In experiments, wherehyperthermia was used, the cells were treated with 0.05 μMNVP-HSP990. Immediately after adding the drug, cells were icubated at 42°Cfor 1 hour and afterwards replaced to 37°C. Figure 1 shows the treatment schedule for these experiments. Schematic diagram illustrating the treatment schedule for cellsurvival experiments. After allowing the cells to attach to the petri dish, the cells were irradiatedwith 0, 2, 4, 6 or 8 Gy without NVP-HSP990. 12 days after seeding,the colonies were fixed with methanol/acetic acid (3:1) and stained with crystalviolet dye (1%). The number of colonies containing at least 50 cells wasdetermined, and the surviving fractions were calculated. The curves werenormalised to SF1 (100% cell survival). The surviving fractions were calculatedusing the plating efficiency for each treatment group (42°C, NVP-HSP990 or42°C + NVP-HSP990 combination). Plating efficiency andsurviving fractions were determined for each cell line and treatment. Cellsurvival curves were fitted by the linear-quadratic modelSF = exp[−(αD + βD2)]. To determine the number of viable cells, trypan blue exclusion tests wereconducted. To assess induction of apoptosis and global cell death, annexin-V andpropidium-iodide (PI) double staining was performed using the Annexin-VApoptosis Detection Kit (Miltenyi Biotec). Briefly, U251 and MIA PaCa-2 cellswere treated with 0.05 μM NVP-HSP990. Immediately after adding thedrug, the cells were incubated for 1 hour at 42°C and then replacedto 37°C. 24 hours later, the growth medium was replaced and the cellswere irradiated with a single dose of 4 Gy. 24 and 72 hours later,the cells were stained with annexin V-FITC and PI and analyzed by FACS (FMT 500)from Beckman Coulter. Exponentially growing U251 and MIA PaCa-2 cells were treated and fixed 8, 24 and48 hours later with 70% ethanol. After storage at −20°Covernight, the cells were washed and incubated with PI (50 μg/mL) andRNase (100 μg/mL) for 2 h at 4°C. After washing, the cellswere analyzed for DNA content by flow cytometry. U251 cells were treated as described. 3 or 5 days later, the cells werefixed, stained with 4'-6-diamidino-2-phenylindole (DAPI) and analysed under anOlympus BX41 fluorescence microscope equipped with a digital camera CC-12 softimaging system (U-CMAD3, Olympus). For each assessment of the extent of mitoticcatastrophe, 200 nuclei were examined. The Mann–Whitney U Test and Kruskal-Wallis analysis of variancewere used to compare quantification data. Statistical analysis was conductedwith Statistical Package for Social Sciences software (SPSS Inc.). We used a2-sided test with significance level of 0.05 for all statistical analyses.Synergy was calculated by the fractional product method that allows anevaluation of synergy at a defined level of effect . Treatment with 0.01 or 0.02 μM NVP-HSP990 (Figure 2A and 2B) did not influence colony formationwhile the treatment with 0.05 μM NVP-HSP990 slightly butsignificantly reduced colony numbers in both cells lines compared to untreatedcontrols (U251 p = 0.0022, MIA PaCa-2 p = 0.042).Similar results were observed if cells were treated with 0.1 μMNVP-HSP990. Sole heat treatment caused modest but also significant reduction ofcolony number in both cell lines (U251 p = 0.003, MIA PaCa-2p = 0.042). The treatment of U251 cells with 0.05 μMNVP-HSP990 at 42°C markedly reduced colony numbers compared to eithertreatment alone (NVP-HSP990 vs. NVP-HSP990 at 42°Cp = 0.00034). Similar results were observed if the cells weretreated with 0.1 μM NVP-HSP990 at 42°C. 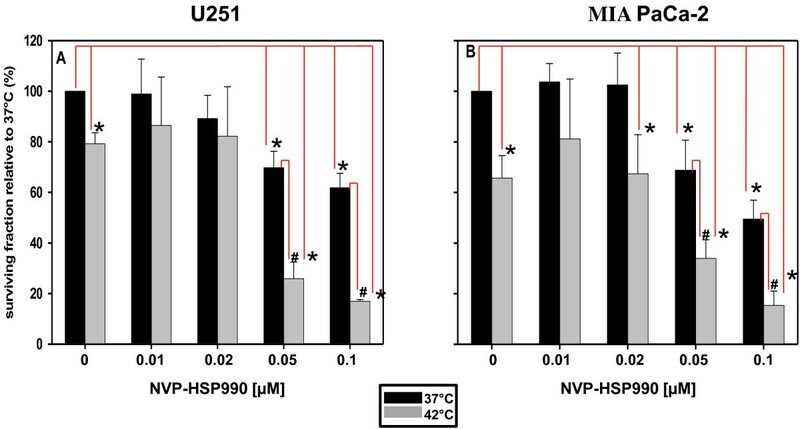 In case of MIA PaCa-2cells, incubation at 42°C in the presence of 0.05 or 0.1 μMNVP-HSP990 caused significant reduction of colony formation compared totreatment with NVP-HSP990 alone (p = 0.00034 for bothconcentrations). Colony forming assay after exposure of U251 (A) or MIA PaCa-2 (B)cell lines to different concentrations of NVP-HSP990 alone at37°C (black bars) or in combination with hyperthermia (greybars). Triplicate data from two experiments were averaged andnormalised against non-treated controls (DMSO). Colonies containing atleast 50 cells were scored. All data are obtained from 3 independentexperiments, each performed in triplicate. The results were consideredto be statistically significant when P < 0.05(“comparison to control”-*, “comparison to drugonly”-#). The influence of NVP-HSP990 on the radiosensitivity of U251 and MIA PaCa-2 cellswas also determined by CFA. Based on the data shown in Figure 2A and 2B, the cells were pretreated with 0.02or 0.1 μM NVP-HSP990 for 24 h, then seeded as single cells andexposed to X-ray doses up to 8 Gy. The radiosensitivity was determined byCFA. Pretreatment with 0.1 μM NVP-HSP990 markedly increasedradiosensitivity of both U251 (Figure 3A) and MIA PaCa-2(Figure 3B) cells at all dose levels while pretreatmentwith 0.02 μM NVP-HSP990 did not change radisensitivity of both celllines. 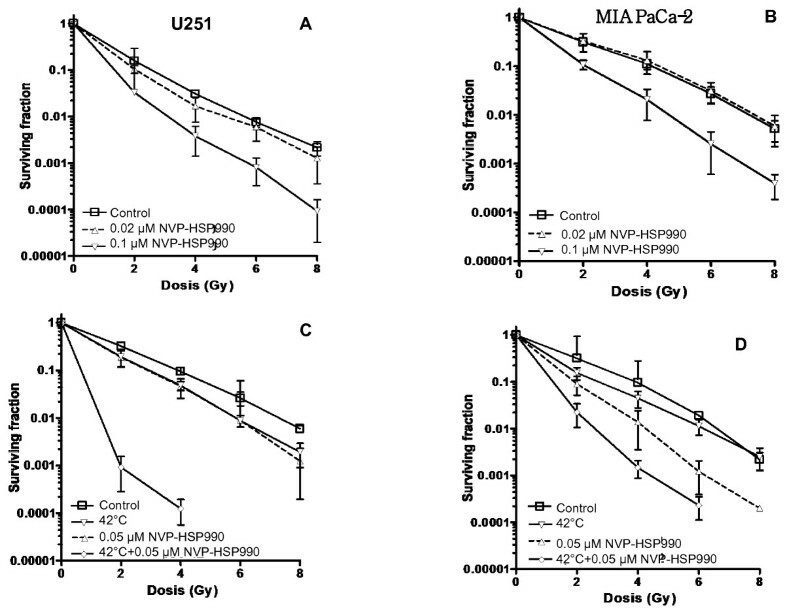 Influence of NVP-HSP990 and hyperthermia on the radiosensitivity ofU251 and MIA PaCa-2 cells (A and B). The cells were incubatedwith 0.02 or 0.1 μM NVP-HSP990 for 24 h. Thereafter,growth media containing NVP-HSP990 were replaced with fresh medium andthe cells were irradiated with single IR doses ranging between 2 and8 Gy (C and D). In the case of the combinedtreatment with NVP-HSP990 and hyperthermia, U251 cells (C) or MIAPaCa-2 cells (D) were simultaneously treated with0.05 μM NVP-HSP990 and 42°C for 1 hour, thenreplaced to 37°C for the next 23 hours and then irradiated asdescribed above. Colony forming efficiency was determined 12 dayslater and colonies containing at least 50 cells were scored. Data showmean values and range of 2 independent experiments each plated intriplicate. The influence of the combined treatment with NVP-HSP990 and hyperthermia on theradiosensitivity of both cell lines was also analysed by CFA. While treatmentwith 0.05 μM NVP-HSP990 or heating with 42°C for 1 hourhad only a modest effect on radiosensitivity of U251 cells (Figure 3C), the combination treatment caused a potentradiosensitization. In case of irradiation with 6 or 8 Gy, no colonyformation was detected anymore. Treatment of the MIA PaCa-2 cells (Figure 3D) with 0.05 μM NVP-HSP990 had a more pronouncedradiosensitizing effect in comparison to U251 cells. Heating of these cellscaused further radiosensitization at any irradiation dose. At a dose of8 Gy, no colony formation was observed anymore. Trypan blue exclusion staining showed that the strongest reduction in viable cellnumbers was indeed achieved in the case of triple combinations (only 5% of thecells survived compared to untreated controls) in U251 (Figure 4A) and MIA PaCa-2 cells (Figure 4D)(p = 0.04935 for both cell lines). All other treatments also causedsignificant antiproliferative effects. MIA PaCa-2 cells were more sensitive totreatment with NVP-HSP990 alone compared to U251 cells. In the case of U251cells, the effects of the double combination of NVP-HSP990 plus hyperthermia(calculated 43%, observed 16% surviving cells) and the triple combinationincluding IR (calculated 4.1%, observed 3.64% surviving cells) were synergisticor additive, respectively, compared to the individual treatments (Figure 4A). In the case of MIA PaCa-2 cells these combinations didnot synergistically enhance the effect of NVP-HSP990 alone, which was verystrong. Analysis of annexin-V/PI -staining by flow cytometry showed thattreatment of U251 cells with 42°C or NVP-HSP990 as sole therapeuticmodalities did not cause remarkable increase in the number of apoptotic/necroticcells while combined treatment had a stronger effect (Figure 4B). 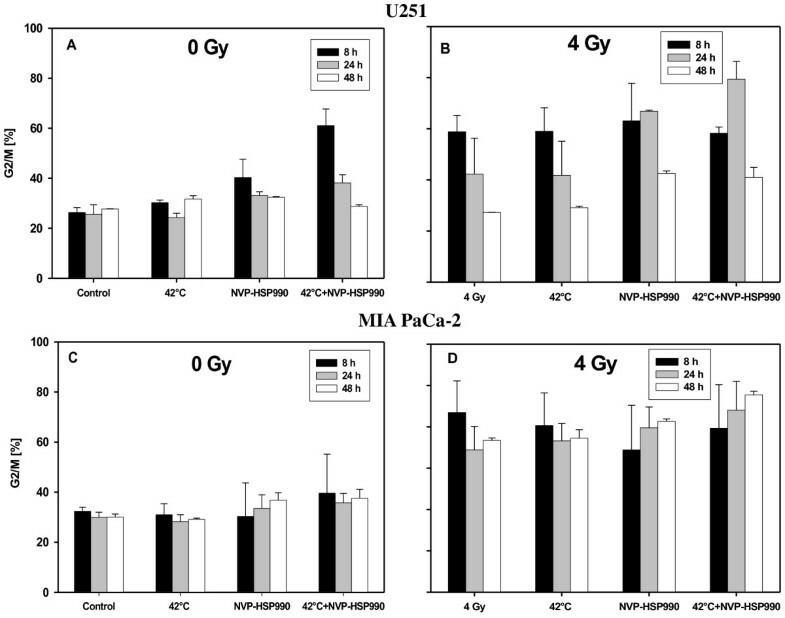 Irradiation with 4 Gy caused a considerable increase inthe number of apoptotic/necrotic cells independently of the treatment (Figure4B). In the case of MIA PaCa-2 cells annexin-V/PI-staining revealed that NVP-HSP990 alone caused a higher apoptotic/necroticpercentage in comparison to U251 cells and that additionally heating of thesecells did not augment the effect of NVP-HSP990 (Figure 4E). The most pronounced increase in numbers of apoptotic and dead cellsin MIA PaCa-2 cells was observed after treatment with the triple combination(Figure 4F). The effects of treatment with NVP-HSP990, hyperthermia and 4 GyIR on cell proliferation and cell death of U251 (A, B, C) and MIAPaCa-2 cells (D, E, F). In figure A and D blackbars represent non-irradiated cells while grey bars represent cellswhich were irradiated with a single dose of 4 Gy. The cells weretreated with 0.05 μM NVP-HSP990 and 42°C for1 hour and then replaced to 37°C for the next 23 hoursin the presence of the inhibitor. Thereafter the culture medium wasreplaced with fresh medium without inhibitor and the cells wereirradiated with a single dose of 4 Gy. 72 hours later, thecells were stained with trypan blue to determine the number of viablecells (A, D). Mean value and SEM from 3 independentexperiments is shown. To detect the percentage of apoptotic/necroticcells, cells were stained with FITC-conjugated anti-Annexin V antibodyand propidium iodide (B, C, E, F). Blackbars represent apoptotic while grey bars necrotic cells. Mean values andrange of 2 independent experiments are shown. Figure 5A shows that U251 cells which were heated with42°C or treated with NVP-HSP990 did not show differences in the number ofcells accumulating in the G2/M phase. 8 hours after treatment withhyperthermia and NVP-HSP990, increased numbers of cells accumulated in G2/M.After 24 or 48 hours there was no difference compared to untreated cells.8 hours after irradiation with 4 Gy (Figure 5B) an increased number of cells accumulated in G2/M, while48 hours after irradiation the cell number dropped to the level ofuntreated cells. A similar result was obtained when the cells were heated beforeirradiation. In the case of the triple combination, maximal G2/M-arrest wasreached only after 24 hours. 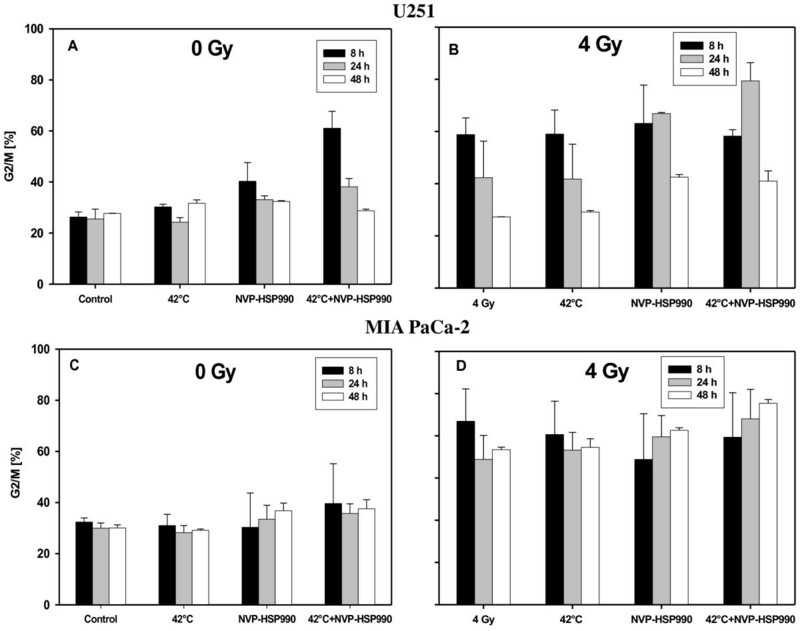 In MIA PaCa-2 cells only irradiation with4 Gy caused an increased number of cells accumulating in G2/M. 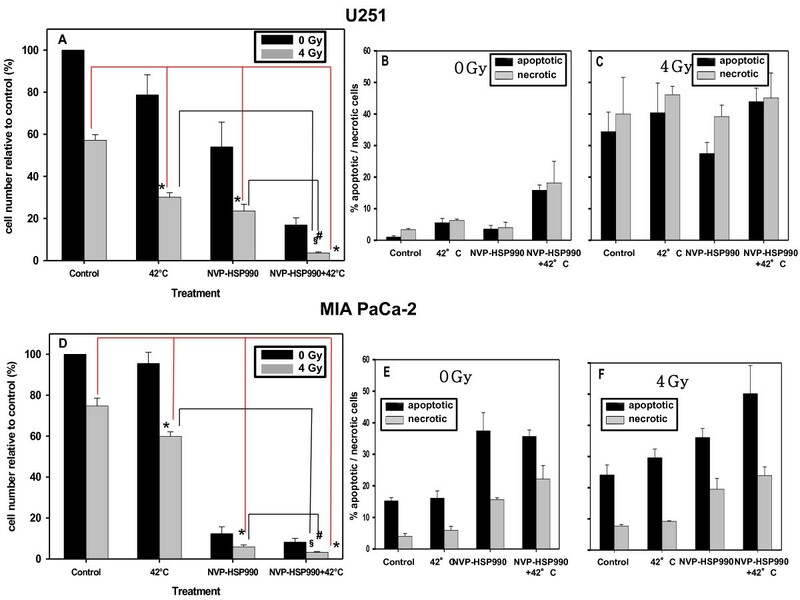 Effect of different treatments on G2/M arrest of U251 (A, B) and MIAPaCa-2 cells (C, D). The cells were heated for 1 h with42°C and treated with 0.05 μM NVP- HSP990 for24 h as a sole modality (A, C) or in combinationwith irradiation with 4 Gy (B, D). The percentage ofcells accumulating in G2/M is shown. Mean values and range of 2independent experiments are shown. 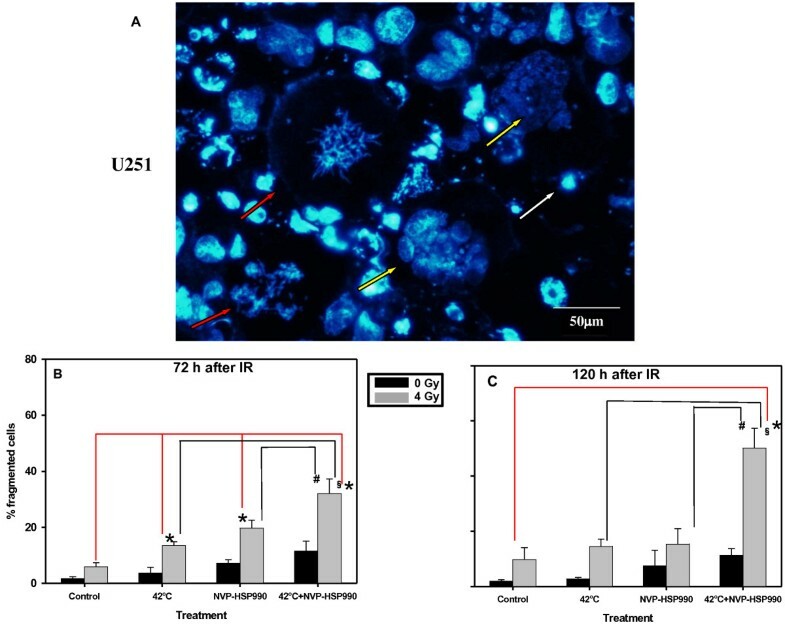 3 or 5 days after a 4 Gy irradiatiation, DAPI stainings were performed and the morphology of the cells and their nuclei were microscopically analysed (Figure 6A-C). Hyperthermia or NVP-HSP990 inhibitor alone did not significantly increase the percentage of cells with signs of mitotic catastrophe (micro- or multinucleated cells), whereas the double combination of the two slightly increased it. In γ-irradiated cells, any additional treatment caused an increase in the number of cells undergoing mitotic catastrophe. The strongest increase (ca. 60% of cells) was found in cultures treated with the triple combination (p = 0.04935). Additive effects were observed after 3 days and 5 days in double and triple combinations (double combination after 5 days expected 9.9% fragmented cells, observed 11.33%, triple combination expected 34.5%, observed 50.16% fragmented cells). Effect of treatments on mitotic catastrophe (A). Representativeimage showing aberrant mitotic figures and increased numbers ofmultinucleated and apoptotic cells observed in U251 cell culture treatedwith NVP-HSP990, hyperthermia and γ-IR. 72 hours or120 hours after γ-IR, DAPI was used to stain the DNA. Yellowarrowheads indicate multinucleated, white arrowheads apoptotic (withcondensed DNA) and red arrowheads cells with aberrant mitotic figures.Quantification was performed after 72 h (B) or120 hours (C) after IR. 200 cells were counted per sample.Mean value and SEM of 3 independent experiments are shown. The treatmant of patients with glioblastoma and pancreatic carcinoma remains achallenge. In the present study, we found that pretreatment with the novel Hsp90inhibitor NVP-HSP990 strongly sensitizes U251 glioma and MIA PaCa-2 pancreaticcarcinoma cells to hyperthermia and IR and particulary to the combination thereof.The triple combination caused a significant reduction in cell number which wasassociated with a morphological alterations typical of mitotic catastrophe andapoptosis. There is a lot of experimental [16–18] and clinical evidence that hyperthermia can increase the effectiveness ofother conventional treatments such chemotherapy  or especially radiotherapy [20, 21]. The exact mechanism how hyperthermia increases radiosensitivity is stillnot completely elucidated but it has been proposed that hyperthermia may interferewith radiation-induced DNA damage . On the other hand, heat shock proteins mediate resistance tohyperthermia . It has been shown that inhibition of Hsp90 with geldanamycin causesdelayed and impaired recovery from heat shock . In HEK293 cells, specific inhibition of Hsp90 together with short termexposure (20–60 min) to 42°C was highly cytotoxic, throughaccelerated degradation of Cdc25A , a member of the CDC25 family of phosphatases which is specificallydegraded in response to DNA damage . These findings support the hypothesis that the antineoplastic effect ofhyperthermia could be potentiated by concurrent inhibition of Hsp90. In ourexperimental conditions, we observed that U251 and MIA PaCa-2 cells which wereincubated for 1 hour at 42°C and concurrently treated with NVP-HSP990showed a significantly lower capability to form colonies in comparison to cellswhich were treated with only one of the two modalities. The effects of combined hyperthermia and irradiation treatment depend on manydifferent factors such a heating temperature, heating time, sequence and timeinterval between the two modalities . Despite intensive research, it is still not clear wheather hyperthermiabefore or after irradiation causes a more pronounced enhancement of radiationdamage. Probably, this effect is cell-type specific. In the case of concurrentirradiation and hyperthermia, maximal additive/synergistic effects can be expectedwhile increasing the intervals of time between hyperthermia and IR, regardless ofsequence, will abrogate the radiosensitisation induced by hyperthermia . As expected, because of the time interval of 23 hours betweenhyperthermia and IR, we observed only a weak influence of hyperthermia onradiosensitivity, cell cycle distribution, induction of mitotic catastrophe andapoptosis. It has been proposed that the radiosensitising effect of Hsp90 inhibitors is causedby degradation of several proteins such a ErbB2, EGFR, Raf-1 and Akt [29, 30] which reportedly can influence radioresistance. DNA repair and cell cyclecheckpoint activation are other proposed mechanisms by which Hsp90 can influence theDNA damage response to IR . A previous study reported that a 24 h-pretreatment with an Hsp 90inhibitor similar to NVP-HSP990, NVP-BEP800, caused an increase in radiosensitivityin two glioblastoma, one lung carcinoma and one fibrosarcoma cell line throughcell-cycle impairment, increased DNA damage and repair protraction . The authors found that changes in the expression of survival markers(Hsp90, Hsp70, Akt, phospho-Akt, Raf-1 and survivin), an apoptosis-associatedprotein (cleaved caspase 3) or of the functional p53 status did not significantlycontribute to the sensitivity of two out of four tested cell lines to NVP-BEP800alone or in combination with IR. Another group found that the geldanamycin-basedHsp90 inhibitor 17-dimethylaminoethylamino-17-demethoxygeldanamycin (17-DMAG)enhances radiosensitization of human U251 and MIA PaCa-2 cells . The treatment of the cells with this compound caused a reduction of theexpression of Akt, Raf-1 and especially ErbB2. The authors further reported thattreatment of DU145 prostate carcinoma cells with 17-DMAG abrogated the G2- andS-phase cell cycle checkpoints and enhanced the radiosensitivity of the cells. It has been reported that treatment of the human lung adenocarcinoma cell line A549with KNK437, an benzylidene lactam compound which acts as a heat shock proteininhibitor, causes the enhancement of thermal radiosensitization in mild hyperthermiacombined with low dose IR . In the same study, it has been demonstrated that KNK437 causedinhibition of Hsp72 and Hsp27 expression. NVP-HSP990 shows a different mechanism ofaction; it binds to the NH2-terminal ATP-binding pocket of Hsp90 while KNK437inhibits synthesis of various heat shock proteins at the mRNA level. KNK437 has alsobeen proposed to induce radioresistance of A-172 human glioblastoma and humansquamous cell carcinoma cells . In our experiments, we observed that pretreatment of U251 cells with NVP-HSP990 andhyperthermia before irradiation with 4 Gy caused a delayed acumulation ofcells in the G2/M phase. The strongest effect was detected 24 hours afterirradiation. Three to five days after the irradiation teatment, we observed a strongincrease of the number of cells with morphological signs of mitotic catastrophe(micro- and multinucleated cells) [34, 35]. The number of apoptotic cells also increased. As large numbers ofnecrotic cells (taking up PI) were not found, this suggests that mitotic catastropheconstitutes a prelude to apoptotic cell death. Similar findings were reported for anovel small molecule inhibitor that lowers the threshold for Hsf1 (Heat shock factorprotein 1) activation . The inhibition enhanced thermal sensitivity and significant thermalradiosensitization followed by loss of mitochondrial potential and mitoticcatastrophe in HT29 colon carcinoma cells. Taken together, our study shows that NVP-HSP990, a fully synthetic, orally availableHsp90 inhibitor exibits strong anti-tumor effects on U251 human glioblastoma and MIAPaCa-2 pancreatic carcinoma cells through an increase of sensitivity towards heatand ionising irradiation. Further preclinical studies are warranted to clarify thecomplex mechanisms of its action and to explore the therapeutic potential of thisapproach in vivo. Dušan Milanović, Elke Firat contributed equally to this work. Authors certify that there is no actual or potential conflict of interest in relationto this article. DM and EF contributed equally to this work. DM was the principal investigator of thestudy and largely wrote the manuscript. EF conducted and analysed flow cytometryexperiments and participated in writing the manuscript. ALG provided clinicalinformation. GN supervised the research, analysed and interpreted data, andparticipated in writing the manuscript. All authors read and approved the finalmanuscript.